The Oklahoma Film & Music Office (OF&MO) is offering internship opportunities in our Oklahoma City office for the 2011 summer season. OF&MO would like to provide interested interns with an understanding of the film and music industries in Oklahoma by involving them in diverse projects. One of the integral duties for which interns are responsible is posting events on the OF&MO Website. They will research and compile film and music events throughout Oklahoma and post them on our Website, http://www.oklahomafilm.org/. In addition, they will draft and edit our weekly e-newsletter, This Week in Film & Music. Interns will also assist with writing press releases for the Website, researching and archiving media clips, working with tools such as Oklahoma’s Online Production Guide Reel-Scout, and are given the opportunity to volunteer for special events sponsored by OF&MO. Also, assistance with general office duties is required on a daily basis. We are particularly interested in intern candidates with experience in film, music, public relations, or marketing for specialized projects. Interns will be selected based on ability, attitude, and university level, with priority given to those in their junior or senior year. Experience with office systems and phone etiquette is encouraged. All internships are unpaid, and are limited to those persons seeking internship credit toward graduation. It is the responsibility of the student to complete all enrollment and coursework requirements set forth by their college. If interested, please submit a resume and cover letter to Abby Kurin at abby@oklahomafilm.org by Monday, May 16. 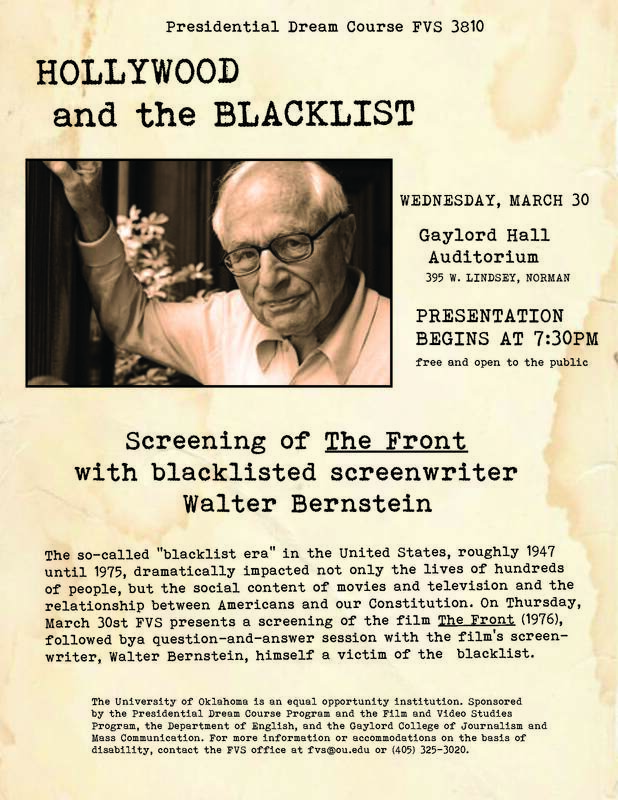 Screenwriter Walter Bernstein will be on the University of Oklahoma campus on Wednesday, March 30th to participate in a free, public event titled “The Hollywood Blacklist, the Movies, and the Making of The Front: An Evening With Screenwriter Walter Bernstein.” Bernstein, who wrote The Front based on his own experiences as a blacklisted screenwriter and the experiences of others he knew, will introduce the film and then participate in a question-and-answer session following the screening at 7:30pm on Wednesday, March 30 in Gaylord Auditorium. The Front stars Woody Allen as a bookmaker who ends up “fronting” for some friends who are writers and who can no longer work under their own names because they have been accused of Communist affiliation. It was one of the first features to deal with the Hollywood blacklist and to exploit for dramatic effect the fact that so many of the people involved in its making were themselves blacklisted. Besides Bernstein, other well-known blacklisted names whose stories are a part of this film include the film’s director, Martin Ritt, and many of the film’s actors, such as Zero Mostel and Herschel Bernardi. Bernstein was nominated for an Academy Award for the script. Born in Brooklyn in the shadow of Ebbetts Field, Bernstein says he was consequently condemned to a hopeless passion for the Brooklyn Dodgers. After graduating from Dartmouth College in 1940, he began publishing fiction in The New Yorker. Drafted into the Army in 1941, he served first in the infantry and then as a correspondent for the G. I. weekly magazine Yank, in which capacity he was the first correspondent to interview Marshal Tito behind German lines in Yugoslavia. During this time he also reported on the war for The New Yorker. These essays were later collected in a book, Keep Your Head Down, published by Viking. After the War, Bernstein wrote for television, the new industry competing with Hollywood, contributing teleplays to such pioneering shows as “Studio One,” “Philco Playhouse” and “Robert Montgomery Presents.” In 1947, he finally went to Hollywood and worked on two movies, All The Kings Men and the Burt Lancaster thriller, Kiss The Blood Off Your Hands (1948). According to Bernstein, when he returned to New York, it was just “in time to be blacklisted from 1950 to 1958 in films and to 1961 in television.” It was during this period that he wrote numerous TV shows under pseudonyms and “fronts,” including material for Walter Cronkite’s “You Are There” with fellow blacklistees Abraham Polonsky and Arnold Manoff. It is the experience of these years that is the foundation for the screenplay of The Front. The first film that Bernstein wrote under his own name after being cleared from the blacklist was That Kind Of Woman (1959), directed by Sidney Lumet and starring Sophia Loren. Since then, his writing credits include another film directed by Lumet, Fail Safe (1964). When it was remade as a live television presentation with George Clooney, Bernstein did the teleplay and was co-executive producer. He was an uncredited contributer to The Magnificent Seven in 1960, but received credit for Heller In Pink Tights that year. Some of Bernstein’s other films include Paris Blues (1961), The Money Trap (1965), The Molly Maguires (1970), Semi-Tough (1978), Yanks (1979), and The House on Carroll Street (1988). In 1980 he both wrote and directed Little Miss Marker with Walter Matthau and Julie Andrews. Bernstein also continues to work in television. During the 1990s he wrote “Doomsday Gun” and “Miss Evers’ Boys,” about the Tuskegee syphilis experiment, both for HBO. “Miss Evers’ Boys” won an Emmy for best picture of l997. In 1999, he did “Durango” for the Hallmark Hall of Fame and he has recently completed the “Simple” stories of Langston Hughes for Laurence Fishburne and HBO. Also for HBO and their series, “Women and Men,” he wrote and directed “Return to Kansas City” with Matt Dillon and Kyra Sedgwick. Bernstein is the recipient of the Writers Guild of America-East Award for Lifetime Achievement, the Gotham Award for Writers from the Independent Film Project, the Hudson Valley Film Festival Screenwriting Award, and the Nantucket Film festival Award. In addition to writing full-time, Walter Bernstein is also an adjunct professor of screenwriting at New York University and Columbia University and creative adviser at Robert Redford’s Sundance Screenwriting Lab and Great Britain’s Moonstone Screenwriting Workshop. In 1996, his memoir of war, movies, and the blacklist, Inside Out, was published by Knopf. Bernstein’s visit is part of a Presidential Dream Course on the Hollywood blacklist taught by Professors Victoria Sturtevant of the Film & Video Studies Program and Joanna E. Rapf of the English Department. For accommodations on the basis of disability or for more information on Bernstein’s presentation, call Film and Video Studies at (405) 325-3020. Jeanne Hoffman Smith has established a yearly FVS scholarship of $1000.00 named for Dr. Heidi Karriker. The award is to be used for a film or media related program/workshop or institute anywhere other than OU. In the past winners have used this scholarship for professional workshops, technical training classes and to provide financial support during unpaid internships. This award is open to FVS juniors and seniors who have a 3.5 GPA or better in the FVS major and at least a 3.2 GPA Overall. Application forms and submission guidelines are in the FVS office. NOTE: Must be used within 12 months from the date of award. Deadline: Friday, April 15, 2011, 5:00 p.m. This award will be given to an OU student to help complete a film or video project. This project must be substantially underway and preference will be given for postproduction and/or exhibition expenses. The Ned Hockman Award was established in 2001 in celebration of the man who put filmmaking on the map at the University of Oklahoma. His career at OU spaned forty-two years – from 1945, when he persuaded President Cross to set up a training program in the little known-technology of television – to his retirement in 1987 as a distinguished David Ross Boyd Professor of Journalism. Any full time OU undergraduate or graduate student with a film or video project may apply. Students should submit a two page description of the project explaining how it came about, outlining the work up to the point of application, and what the student hopes to do with the completed project. A separate page should list the budget already spent and funds needed. A production reel of the work must also be submitted. A letter of recommendation from a sponsoring professor or organization must accompany applications. Ted and Pam Withrow established the C. Clay Withrow Film and Video Studies Writing Award, named in honor of their son, to encourage excellent and imaginative writing about film or television. The $500 annual prize recognizes the best essay written on a film or video studies topic by an OU sophomore, junior, or senior (seniors must have at least one semester left before graduation). The candidate must have a cumulative GPA of 3.00 or higher at the time of application, OR must be nominated by an FVS faculty member for the award. Papers will be judged on originality, insight, and the quality of the writing and prose style. Ted and Pam Withrow established this prize to honor excellent and imaginative student writing for the screen. The $500 annual prize recognizes the best screenplay written by an OU FVS sophomore or junior. The candidate must have a cumulative GPA of 3.00 or higher at the time of application, OR must be nominated by an FVS faculty member for the award. Screenplays will be judged on originality, the quality of the writing, and adherence to correct format. For Further Information regarding any of the scholarships, contact the FVS Office at fvs@ou.edu or 405/325-3020. 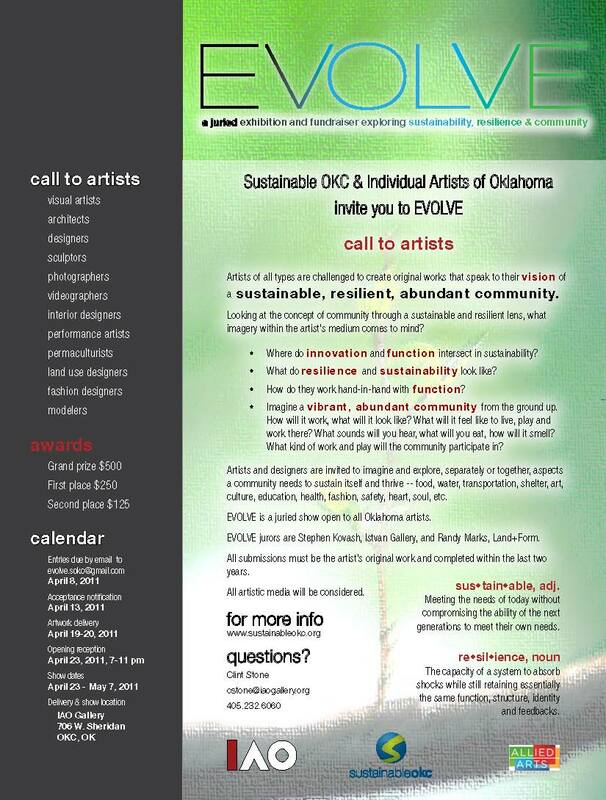 Sustainable OKC & Individual Artists of Oklahoma invite you to EVOLVE, a juried exhibition & fundraiser exploring sustainability, resilience & community, opening April 23, 2011. Oklahoma artists in all media are invited to create original works that speak to their vision of a sustainable, resilient, abundant community. If you can’t see the details in this email, see the attached PDF, or go to www.sustainableokc.org for details. The Thunderbird Film Festival is now accepting submissions for our tenth annual event, taking place April 8, 2011. Held on the Southern Utah University campus in beautiful Cedar City, Utah, the Festival will continue its tradition of connecting student filmmakers and their work to new audiences, as well as providing unique opportunities to learn from professionals in the business. The Festival offers two separate categories for entry: The Thunderbird Competition (college, independent films), and the High School Competition. All entries will be critiqued on both technical and artistic skill. Winning entries will be screened during the the event, and the filmmakers will receive VIP invitations to attend. All entries must be received by 5:00pm on March 25, 2011. For a list of specific guidelines, deadlines, and contact information, please visit our website at www.thunderbirdfilmfestival.suu.edu. The 2011 Thunderbird Film Festival promises to be an exciting and educational event. Although there is a competitive aspect to the films selected for screening, the Festival regards itself as a celebration of independent filmmakers. We build a collective of creative artists, providing opportunities for everyone to interact, build, and dream together. We invite you and your students to join us in April for this incredible event. Please join FVS for the 2nd lecture in a series for the FVS Presidential Dream course “The Hollywood Blacklist” with Dr. Victoria Sturtevant and Dr. Joanna Rapf. The so-called “blacklist era” in the United States, roughly 1947 until 1975, dramatically impacted not only the lives of hundreds of people, but the social content of movies and television and the relationship between Americans and our Constitution. 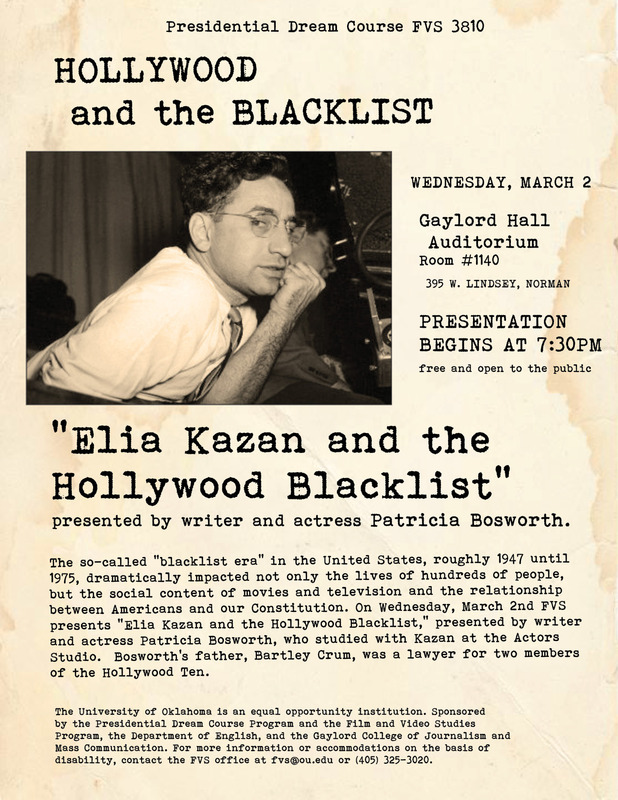 On Wednesday, March 2nd FVS presents “Elia Kazan and the Hollywood Blacklist,” presented by writer and actress Patricia Bosworth, who studied with Kazan at the Actors Studio. Bosworth’s father, Bartley Crum, was a lawyer for two members of the Hollywood Ten. Take heed young filmmakers. We found this post about indie movie tropes that have been played out and thought you might want to take a look. There’s some good advice as to what to avoid when you’re scripting your new film.